MAE SAI, Thailand (AP) — The leaders overseeing the desperate and dangerous rescue of 12 young soccer players and their coach from a flooded cave labyrinth in northern Thailand were only half joking when they quipped that success was in the hands of the rain god Phra Pirun. They were celebrating a second triumph after divers guided four more boys through tight passages and flooded caverns to safety Monday. "Two days, eight Boars," read a Facebook post by the Thai navy SEALS about the operation that began Sunday, more than two weeks after the Wild Boars soccer team became trapped. Another five still await rescue, including the team's 25-year-old coach. The eight rescued boys were recuperating in a hospital from their ordeal huddling on a dry patch inside the Tham Luan Nang Non cave that became flooded by monsoon rains while they were exploring it June 23. Their families were being kept at a distance because of fears of infection and the emaciated-looking boys were eating a rice-based porridge because they were still too weak to take regular food, authorities said. Officials lavished praise on the Thai and international divers who executed the dangerous rescue mission, guiding boys who can barely swim and have no diving experience through a treacherous 4-kilometer-long (2 1/2-mile) escape route that twisted and turned and rose and fell inside the mountain cave complex. Highlighting the extreme dangers, a former Thai Navy SEAL died Friday while replenishing the oxygen canisters laid along the route. But the chances of monsoon rains raising water in the cave again, endangering their dry refuge and making the escape route too risky, were never far from the minds of everyone involved. Alluding to that worry, the regional army commander offered his thanks Monday to the rain god Phra Pirun, imploring him to "keep showing us mercy." "Give us three more days and the Boars will come out to see the world, every one of them," Maj-Gen. Bancha Duriyapan told a news conference punctuated by applause from the dozens of Thai and foreign journalists and others in attendance. "I beg Phra Pirun because the Meteorological Department said that from Monday on there will be continuous rain," Bancha said. "If I ask too much, he might not provide it. So I've been asking for three days." The plight of the boys, aged 11-16, and their coach, has riveted Thailand and much of the world — from the heart-sinking news they were missing to the first flickering video of the huddle of anxious yet smiling boys once they were found by the pair of British divers deep in the sprawling cave. Then came the letters carried out by divers who took oxygen, food and medicine to the boys' refuge as experts evaluated whether to dive them out or provision them, perhaps until monsoon rains usually subside in late October. Writing in elegant Thai script, the boys urged their parents not to worry, adding that they hoped they wouldn't get too much homework after being rescued and couldn't wait to eat their favorite foods again. Their friends were full of optimism — and worry. Phuwadech Kamnguen, a 14-year-old best friend of one of the trapped boys, said he's looking forward to eating KFC with the team again. "Even when my friends have left the cave, I'm worried about their physical well-being. From what I've seen in the clip, they did look skinny," he said. The boys' nightmare experience — trapped in claustrophobic darkness by rising waters — resonated across the globe, riveting people both in Thailand and internationally who anxiously watched the news coming from this town along the border with Myanmar. After Monday's rescues, Prime Minister Prayuth Chan-ocha visited the hospital where the eight freed boys had been taken by helicopter. 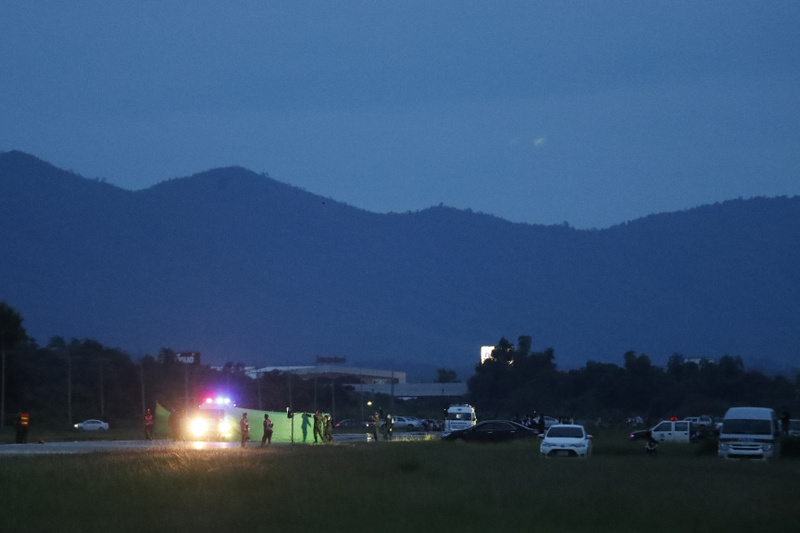 Chiang Rai province's acting governor, Narongsak Osatanakorn, who is in charge of the rescue, voiced confidence Monday in the ongoing operation, provided the weather doesn't worsen. Workers have been laboring around the clock to pump water out of the cave, and downpours overnight Sunday and Monday did not raise the water levels inside. More worrying, however, oxygen levels in the cave were falling. Narongsak said Monday's rescues involving 18 divers and a support team of 100 had taken nine hours, two fewer than the rescues on Sunday. "We have more expertise than yesterday," he said. That sense of accomplishment was also reflected in the message posted Monday night on the Thai Navy SEALS's Facebook page announcing the latest rescues. It ended with their fighting cheer, adopted from the U.S. Navy: "Hooyah!" But bringing out the remaining four boys and their coach could take more than one operation, Narongsak warned. All preparations, including replacing the oxygen cylinders positioned along the route out in the cave, take at least 20 hours, he said. The safety of the divers, who have meticulously planned the mission, is also paramount. "If Phra Pirun helps us, we might be able to do it very quickly," Narongsak said, again invoking the god of rain, who is widely revered in Thailand. "But if Phra Pirun doesn't help, then it might be a little late."